Joanne Greenbaum, Untitled, 2014, oil, ink and acrylic marker on canvas, 90 x 80". Joanne Greenbaum is an artist who lives in her studio. It is easy in her latest exhibition, the inaugural show at Rachel Uffner’s new gallery, to sense the olfactory appeal of her processand, in fact, her practice offers another idea of the studio as a factory. Instead of Warhol’s cool Fordian mass production, the one-person Greenbaum factory creates singular, unique works of organized chaos. For example, the repetitive scrawled doodle marks evident in some works suggest a hand neurotically filling a coloring book at pace, while the broad-brushed, casual painterly gestures aspire to bring a discrete tentacle shape into focus. Alongside these opposing attitudes are drips, scumbled brushstrokes, melting puddles of color, and discontinued architectonic shapes, all of which playfully jigsaw together a bigger picture that hints at degrading logic and systemsas if Greenbaum were changing thoughts midstream. Adding to this disorderly impetus is the range of media she works with, including paint, ink, Flashe, marker, oil stick, and pencil, which are all often combined in the same space. 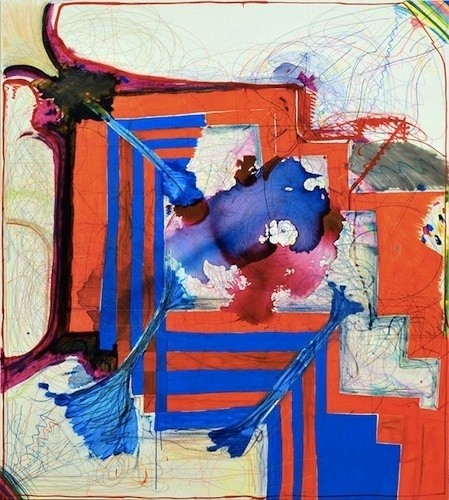 The tension created by this seemingly automatic mark-making sits at the juncture of drawing and paintingthat is, between the structuring logic of line versus the emotive suggestion of color, which in another era would have been construed as the struggle between the intellect and the romantic. This edginess could also be construed as embodying the persistent heat of city livingthe city being an analogue to the factory in modern life. The eight large, untitled ninety-by-eighty-inch paintings, hung tightly in this tall, squarish space, create both the intensity and the diffusing and disorienting energy associated with urban life. Ultimately, though, Greenbaum’s ebullient outpouring can best be characterized by a single word: gleeful.